The art of creating beautiful patterns on nails (nail art), allows you to make a manicure not only neat, but also effective, attracting attention. It is not necessary to constantly visit beauty salons: pictures can be learned to draw by yourself. The correct technique of nail design can not do without specific tools: in any specialized store you can buy very thin brushes, allowing even beginners to make the lines of the drawing clear and accurate. It's even easier to create beautiful patterns with the help of "dots". This device looks like a fountain pen, but at the end it has a rod with a ball. The thickness of the line directly depends on the size of the instrument (the most popular 1-10). 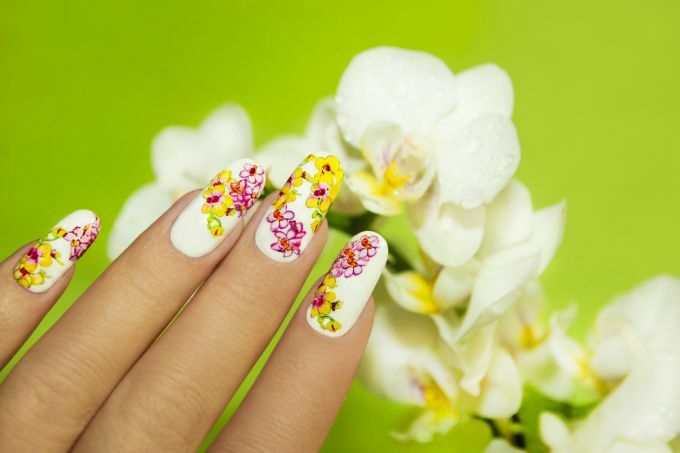 You can not engage in nail art on weight, on the road or in bed: to achieve the desired result, you should sit at a well-lit table, conveniently placing everything on it. When working with dots, acrylic or tempered liquid pigments are usually used. The ball, located at the end of the instrument, is dipped in the paint of the desired shade, and then, using a neat, short motion, apply a pattern to the nail. Dots allows you to create beautiful cascades from points, where each successive turns out slightly less than the previous one, if you do not recruit paint again. It is also convenient for smooth gradually thinning lines. The technique of drawing resembles the work with a fountain pen. Periodically you should wipe the ball from sticking excess paint. Drawing with a brush is much more difficult, but, having mastered it, you can create on nails much more diverse and elegant Pictures, than when using dots. For fine details, you need a thin sharp brush, for mixing paints and the creation of large curls – flat. There are other devices with extra long or fan-shaped bristles, but to properly use them, you need a certain experience of nail design. The technique of movements does not differ from the usual drawing on a piece of paper. When using a brush, you can use both acrylics and regular nail polish, but it has a thicker texture and allows you to build only the simplest compositions. If you do not want to buy special tools, you can do with a regular needle or toothpick to create pictures on nails. Quite beautiful patterns can be created with the help of a regular needle or a sharp wooden stick, but they should be worked very carefully so as not to scratch the nail plate. With this method of drawing, the point serves as a fine brush. It is important to ensure that excess paint or varnish is not drawn onto the tool. Подобные домашние приспособления лучше всего подходят для техники растягивания. Здесь используются лаки контрастных оттенков: на весь ноготь наносят основной цвет, затем, не давая ему высохнуть, поверх ставят большую точку другого оттенка, а в ее центре еще одну, контрастирующую. Острием иглы или зубочистки из центра последней точки ведут линию произвольной длины, которая растягивает быстро подсыхающий лак в эффектный узор. Несколько линий, вытянутых из центра, создают подобие цветка. При желании любые рисунки можно украшать стразами и блестками, но они должны быть однотипными на всех ногтях, чтобы не создавалось ощущение хаоса и безвкусицы.